A proclamation. A bar for sale. In the Big Horn Basin. Fair price. Just thought you'd like to know. Google and Mike's own knowledge of the basin soon revealed that Burlington was a town of 300 people, primarily LDS (Latter-Day Saints/Mormon). But owning a bar. Could be worth it. Mid-November 2012: The fateful call from Tom Harrington making the couple aware of the possibility. Thanksgiving 2012: Offhanded remark to Harland and Brenda that the couple was considering, to some degree this new opportunity but really had no idea. Followed by enthusiasm and support from the Allen's claiming the success of others who had taken on similar opportunities and suggesting pizza as the food to be lovingly prepared and served. 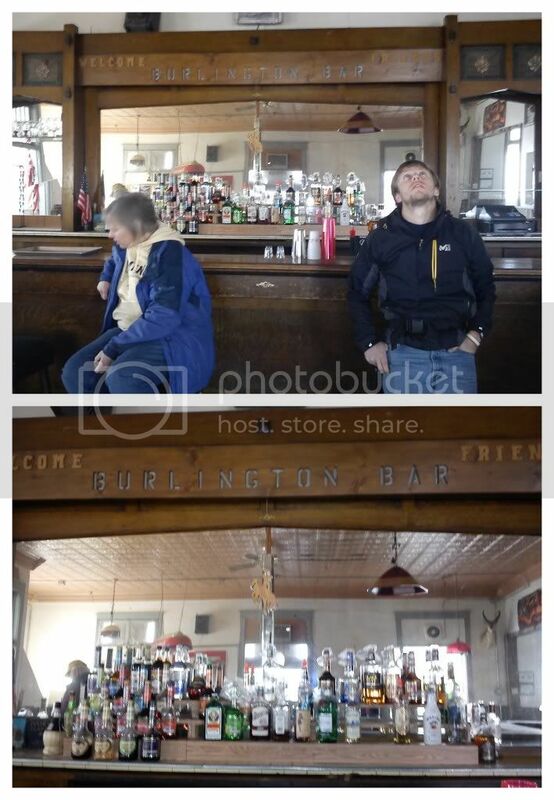 December 2nd, 2012: A trip to Burlington, Wyoming to enter and view the Burlington Bar, to begin thinking through the true potential and desire. To view Burlington as a potential home, a place to settle and a place to pursue a dream. December 2012: Research and dreaming. Thinking and talking. Discovering and learning. December 27th, 2012: The preparation of a proposal to purchase the Burlington Bar in 90 days, after receiving financing. December 28th, 2012: Offer accepted. January 2013: Planning and developing. Working on a business plan. Acquiring LLC (limited liability corporation) status. Mastering pizza, dreaming up recipes and names. Requesting help from friends and their expertise of graphic design. Early February 2013: Polish the business plan, begin conversations with loan officer, health inspector, town of Burlington employees, etc. Eve of February 19, 2013: Submit business plan to loan representative, wait with fingers-crossed. Month of March 2013: Waiting. Praying. Pizza-making. Home-brewing. Emails with loan officers, parents, insurance agents, realtors, etc. Spring Break 2013: Inventory products left at the bar, show it off to friends and family, create bank accounts, choose paint colors, start opening up about future plans. March 22, 2013: Close on the bar. Keys and business in hand. And where are the couple heading now, what is the abbreviated version of the Business Plan they worked so long and hard on? From here, the Harringtons have every intention of finishing out their contract with Albany County School District #1 which means the couple will reside in Laramie, WY until June 6th before heading North to Burlington, WY where they have a house awaiting their arrival (come July) and a business to love and care for until she matures into all her beautiful potential. Hopes revolve around having the bar and pizzeria portions of the business running this summer, mid-June being desired for all operations, although the pizza may take a bit more time simply because the location currently lacks a properly functioning pizza kitchen. As for the brewery, the Harringtons would like to get microbrews on tap as soon as possible but have a whole new set of paper-work to tackle and are hopeful that the microbrewery portion of the business will be ready to roll within one year of owning the Burlington Bar. The duo is still debating the official name of the business and have begun thinking through color and interior decoration themes and colors to bring new life to this old building. As for running a bar in a small Wyoming town with a large LDS population, the Harringtons are confident that they posses the character and food-producing skills necessary to break down some walls and bring in more members of the community. Prior to the Harringtons ownership of the business, the Burlington Bar has been sustained since 1934, without food. Prior to 1934 the building was a bank. Twice robbed, the bank, which was originally built in 1917 was quickly turned into the bar that it's been ever since. The couple is excited about the history of the building, the location of the town and the business and the opportunity to pursue their dreams in this season of life when they are young, adventurous and without dependents. Friends and readers of THT can keep their eyes posted here and on Facebook for the latest information and eventually websites, blogs, Facebook pages, etc. to keep up with The Burlington Bar Project and of course, the duo expects a healthy number of our dear readers to start planning some summer or mid-winter or any-other-season road-trips to the Basin! I will have to thank Tom when I see him next week for planting the seed! There are lots of us who are very excited to have you coming into our community and improving this historic building! We are also looking forward to the pizza! Next time I see you there I am looking forward to stopping and introducing myself . Welcome to our community!